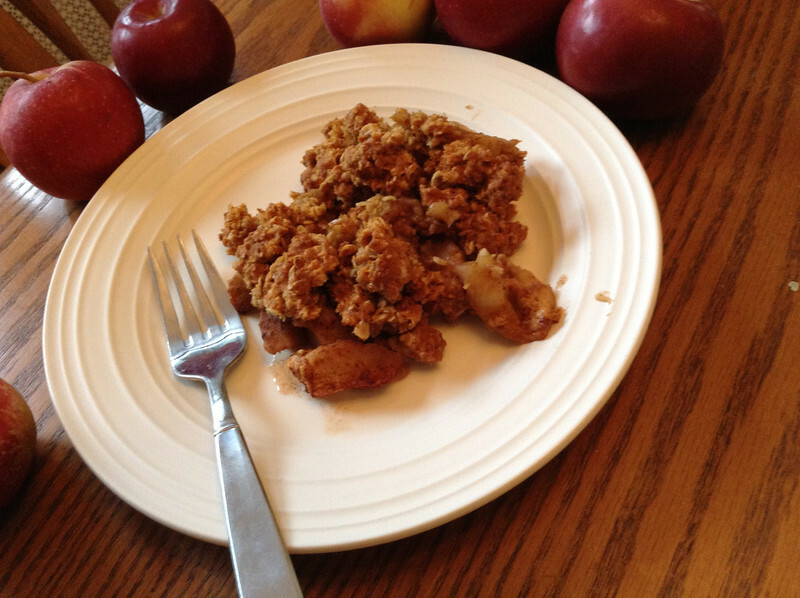 Clean Eating: Apple Crisp Mama Say What?! | Mama Say What?! I’ve recently fallen in love with “clean eating.” For those of you who aren’t familiar with the term (like I was a few months ago), it’s eating little to no processed foods, avoiding alcohol, white flour, white sugar and artificial sweeteners. It’s eating a ton of fresh produce, egg whites, lean meat, rice, beans and other “whole” foods. Most things that come in a pretty package (think Pop-Tarts, granola bars, pretzels and cookies) are off limits, or to be enjoyed only as a special treat, not every day. If you’d like to give clean eating a try, check out a “Clean Eating Shopping List” for beginners here. In the Northeast, the fall season means apple picking season so I was giddy at the thought of finding a clean eating recipe for apple crisp. I tried this one and LOVED the results. This recipe was the inspiration, but I did tweak it a bit to make it work for me. NOTES: You could use any combination of agave, maple syrup, honey or Stevia to fit your taste. Stevia is quite strong though, so less is more! Also, you could substitute olive oil for the coconut oil. 1. Peel and slice the apples and throw them in a bowl. Add the cinnamon and 1 tbs of the maple syrup and mix well. 2. 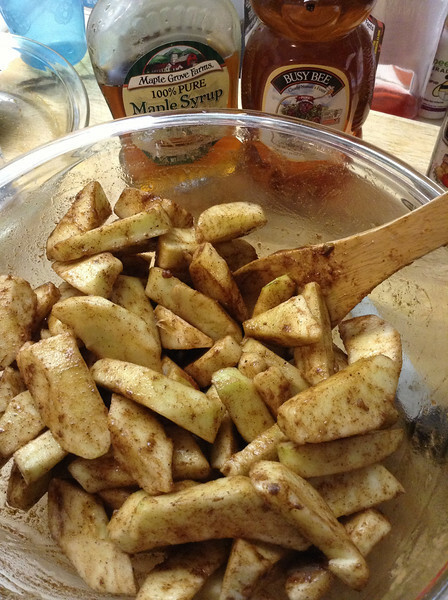 Pour the apples into a greased casserole dish. I used a round pan, but a 9×13 would work. 3. In the same bowl, combine the remaining maple syrup, honey, lemon juice, flour, oats, baking soda, baking powder, salt and coconut oil. Mix well. 4. 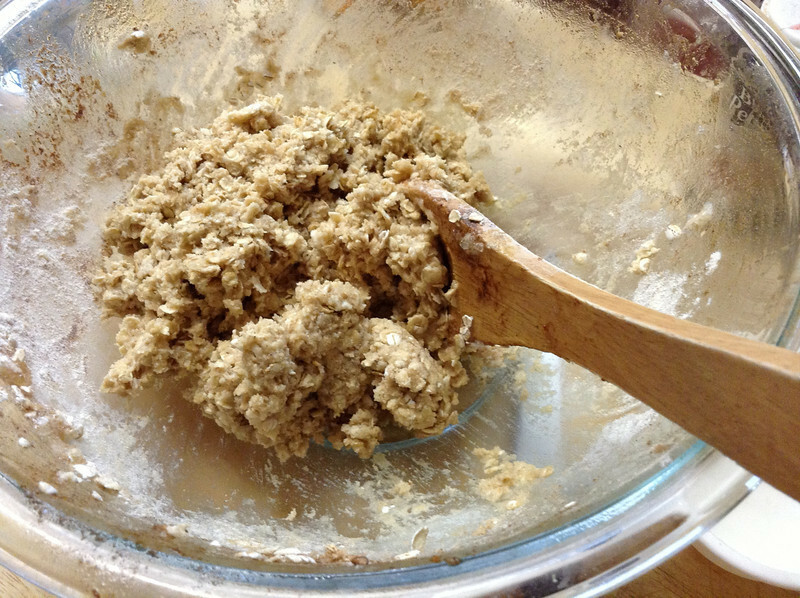 Spread the oat mixture over the apples. 5. Bake for 25 minutes at 350 degrees F. The top should be golden brown. This recipe makes about 6 servings. Our whole family enjoyed it straight from the oven. If you’re not really into the clean eating thing and just an apple fan, you’d probably enjoy a scoop of vanilla ice cream with it. Either way, it’s a delicious fall treat! It’s easy to prepare and a crowd-pleaser for sure. A delicious fall treat that’s a yummy addition to any clean eating diet. It’s also vegan! 5. Bake for 25 minutes at 350. The top should be golden brown. *You could use any combination of agave, maple syrup, honey or Stevia to fit your taste. Stevia is quite strong though, so less is more! *You could substitute olive oil for the coconut oil. Added by MaryEllen M. on January 3, 2014. Could the flour be substituted with almond flour or coconut flour? Mindy the original post calls for almond flour -so I’d say definitely! Just made this with gluten free all purpose flour and it’s delicious! I sprinkled extra cinnamon on top and some nutmeg. Next time I think I will add a little vanilla extract as well. would love the original post w almond flour. so much more nutritious! do you think this will freeze well? any thoughts on defrosting? 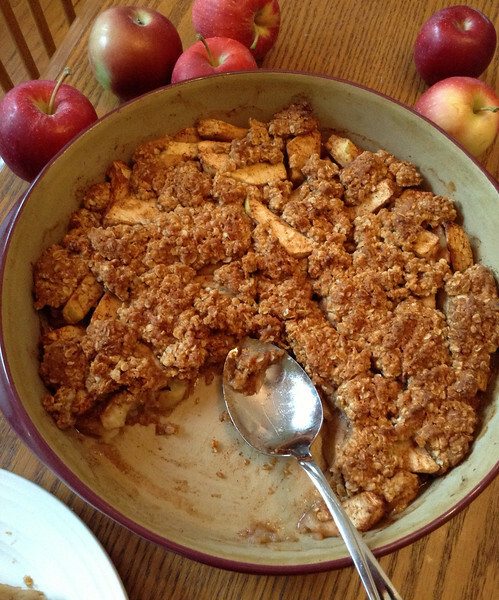 I made this “Clean Eating Apple Crisp” for a group of friends and it was a HUGE hit! We had some special dietary needs in our group so I substituted the maple and honey both with organic molasses. It gave it a sophisticated flavor (almost a little like bourbon) and was almost like a chocolate dessert. We also used gluten free rice flour- came out great. Have enjoyed with orange zest and a side of ricotta cheese. This was amazing!!! I added cinnamon to the crumble top. SO SO good. Thank you for this recipe! Question though: If I have left overs, can I keep them out covered or does it need refridgerated? Thanks!